When I was a kid, my favorite toy was a portable record player, which kicked off my lifelong love of music (and vinyl). One year, my brother and I both received Disney soundtracks: I got Bambi—lame, redeemed only by “Little April Shower”—while my brother received the infinitely superior The Jungle Book. I have to emphasize just how important those soundtracks were in the days before YouTube or even home video. Before Disney began putting its classic films on VHS in the mid-1980s (The Jungle Book wouldn’t appear until 1991), the only way to see them was every seven years, when Disney would rerelease one of them to theaters. But their soundtracks, which came with matching picture books, helped us pre-internet, pre-DVD kids recreate those movies in our brains. I soon swiped The Jungle Book from my brother, and I listened to it every chance I got. Somehow, I never, ever tired of it. Even in college, I would drop “I Wan’na Be Like You” on the mixtapes I made for friends. Years later, I pummeled my own kids with the Little Golden Book version of what my toddler daughter called the story about “the girl in the red underwear.” But it wasn’t until this year’s 50th anniversary—and after watching online documentaries like Walt Disney’s “The Jungle Book”: The Making Of A Musical Masterpiece—that I ever really considered what made it so special, beyond my own personal affinity for it. To begin with, The Jungle Book was the last animated feature Walt Disney ever personally worked on. His previous effort, 1963’s The Sword In The Stone, was considered less than a success, so he took a firm guiding hand on his next project—even instructing his team not to read the Rudyard Kipling book it was based on. Kipling’s tale of a boy, Mowgli, who’s raised in the jungle by wolves and finally escorted back to the “man village” by benevolent panther Bagheera proved to be a tough one to adapt. To aid Disney’s team of “nine old men,” including director Wolfgang Reitherman and animators Frank Thomas and Ollie Johnston, he suggested bringing in bandleader Phil Harris to voice the pivotal character of Baloo, the carefree bear Mowgli befriends along the way. That kind of stunt-casting wasn’t the norm like it is today, where Mandy Moore and Tom Hanks rake in millions doing voice-overs. Instead, Disney’s left-field suggestion grew out of his personal friendship with the musician, who had been entertaining audiences since the 1930s as the baritone-voiced bandleader on The Jack Benny Program, where his signature song was “That’s What I Like About The South.” Harris proved so popular that he and his wife, Alice Faye, eventually spun off into their own, Rexall Drug-sponsored radio sitcom about their home life. There, Harris played a slightly fictionalized version of himself—a not-that-bright, yet never-stressed guy who just liked to have a good time. It made him a perfect fit for Baloo. Nevertheless, Harris found The Jungle Book script a bit stilted at the first read-through, and he asked if he could just do it his own way. His loose delivery, full of ad-libbed slang, gave the production team all the necessary inspiration to create Baloo (one of the greatest characters in Disney history, according to Incredibles director Brad Bird). And it helped animators Thomas and Johnston—best pals who had offices right next to each other—to nail Baloo’s relationship with Mowgli, much of which they’d based on their own friendship. 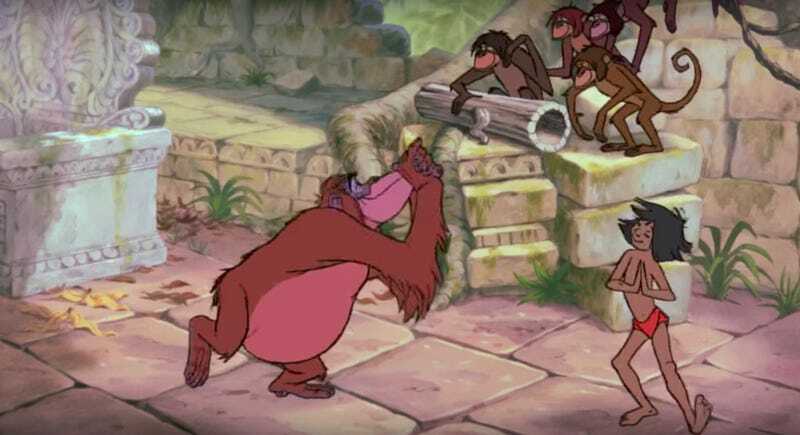 Harris’ uptempo speech patterns, honed by years in smoky clubs, also fit in perfectly with The Jungle Book’s jazzy score, a decidedly modern choice for a studio that had always tended toward the classically orchestral (with Peggy Lee’s songwriting turn on 1955’s Lady And The Tramp a notable exception). Composer George Bruns kept that reactive, improvisational feel, bringing tension to the film’s frequent jungle chases with heightened horns while also turning the rhythms of Baloo’s boxing lesson into a captivating drum solo. The songs, on the other hand, had a tougher time coming to fruition. After the first round of tunes by Terry Gilkyson were deemed too dark, Disney brought in brothers Richard and Robert Sherman, who had crafted hooky hits for the likes of Mary Poppins and Chitty Chitty Bang Bang, and whom Disney lovingly referred to as his “sons.” He was ready to scrap Gilkyson’s compositions altogether, but there was one song his crew begged him to keep. They were right: Baloo’s laid-back mantra of “The Bare Necessities” helped grab The Jungle Book its only Academy Award nomination, for Best Original Song. Although Harris busts into “I Wan’na Be Like You” before the song is over, as Baloo is transfixed by “that crazy beat,” the two greats never actually met in the studio. Instead, Prima recorded his parts first, while Harris improvised his own scats against Prima’s “oo-bee-do” primal beats. I believe the final result is—as my many mixtapes would attest—the greatest song ever recorded in the Disney canon. Harris, Prima, and Academy Award-winning actor George Sanders (who lent his silky, menacing voice to the deadly tiger Shere Khan) were all considered unusually high-profile stars for an animated movie at the time. But even they might have been upstaged had the studio landed its first choice of hiring The Beatles to play a group of vultures who befriend Mowgli in the jungle, even having them drawn with their iconic “mop tops.” While the band turned down the offer, the studio kept the Liverpool accents intact, drafting Chad Stuart (of the duo Chad & Jeremy) to help turn the vultures’ song from a pop tune into a barbershop quartet. This, Walt Disney believed, would keep it from ever sounding dated. The Jungle Book featured not only familiar voices, but melodies. Kaa’s song “Trust In Me” was a discarded cut from Mary Poppins, previously known as “The Land Of Sand.” The scratchy-voiced Holloway—a skilled performer who could go from playing Winnie The Pooh to the devious Kaa in just two movies—turned “Trust In Me” into a creepily hypnotic dirge, delivered as Kaa tries to lull Mowgli into a stupor so he can eat him. The Shermans also cleverly wove “My Own Home” into the film’s background score, so that by the time the song shows up at movie’s end, it seems familiar—like they’re coming home right along with Mowgli. “My Own Home” is a bittersweet ending, wallowing in a minor key as Baloo says goodbye to his friend, now returned to the “man village” where he belongs. But The Jungle Book actually goes out on a more cheerful coda as “Bare Necessities” gets a reprise from Baloo and Bagheera. For many, The Jungle Book marked the last gasp of Disney’s golden age, a malaise that continued until the resurgence kicked off by 1989’s The Little Mermaid. Whether you believe that—Harris, who went on to star in 1970’s The Aristocats and 1973’s Robin Hood, might have begged to differ—the film is certainly unique within the Disney canon. Neither classic fairy tale like Cinderella or Snow White And The Seven Dwarfs, nor one of its animal tragedies like Dumbo or Bambi, The Jungle Book is an unabashedly joyful, unusually jazzy exploration of friendship. While there are plenty of other contenders for “best” Disney soundtrack—some even abetted by modern heavy-hitters, like Elton John on The Lion King and Lin-Manuel Miranda on Moana—the musical chemistry of The Jungle Book remains, for me, difficult to surpass. I’m definitely not sorry I stole it from my brother.